When we think of being bold, I guess most of us think about toughness and courage - times when we have the fortitude to stand for which we have strong convictions, even if it invites insult and rejection. I like the word BOLD. This is what I think we all dream to be. Nobody wants to be wimpy. 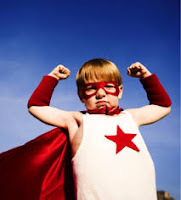 Inside me as a little boy there was a super hero wannabe who fantasized about thwarting the bad guy and saving the day. I think all of us want to be that person who stands firm under pressure and dares to do what's right, even if it means standing alone. But what can compel us to such boldness and give us the wisdom to discern for what to be bold? We don't want to confuse bold with obnoxious. What we need is the right kind of bold for the right things. We need bolder faith. Faith means that we trust God with everything. A bold faith is when we have such strong conviction about the object of our faith it allows us to overcome fear or doubt and to take action. Bold faith compels us to take risk for the glory of God. Peter stepping out onto a stormy sea to go to Jesus is the perfect picture of such a bold faith. Peter took the risk in order to go to Jesus, and he succeeded for a moment, but ultimately failed in the attempt. But he got out of the boat! And even in his moment of glorious failure his faith grew enormously, preparing him for his future. If we have strong conviction about following Christ, we will be compelled to be bold, brush aside our fears, and simply trust God, leading us to the right actions. Too often our conformity to this world, disobedience and poor witness comes from fear that makes us not trust God with results. A bold faith knows that sometimes we mess up, but even in the mess up we are moving forward with God, learning to trust Him more everyday with everything. We need bolder prayer. A bold prayer life is grounded in a strong conviction that what God's Word says about prayer is absolutely true. The church lacks power because it doesn't pray and is not filled with the Holy Spirit. We constantly have too much worldly thinking and behavior in us. When we adopt a bold prayer life, we first learn to pray correctly. We don't simply treat prayer like "break glass in case of emergency" tool. We come to understand that prayer is only effective when we ask according to God's will. Every prayer must be offered with the disposition of "Thy will be done." And not just in a vague, general sense, but in the specifics of my life, those I love, and my church. Bold prayer is confident in the promises God has given about acting through our prayers to accomplish His will. Bold prayer is compassionate about others spiritual needs. We must pray for the lost and the wayward fellow Christian with great urgency and earnestness. And bold prayer is consistent. It is a nurtured spiritual discipline of the greatest importance, and it takes practice. This is why Jesus taught His disciples to pray. This is why we need to frequently renew our minds to the model prayer in Matthew 6 because it teaches us how to pray. And this is why believers of a congregation must pray together. We need bolder lifestyles. A bold lifestyle takes the instruction of God's Word and seeks to fashion its thinking, behaviors, habits and attitudes to it. The Bible clearly gives us both a don't and a do in regards to our lifestyles. We are told not to be conformed to this world. We are to resist the ungodly thinking and behavior that we swim in culturally everyday. We are in this world, but we must not allow ourselves to be putty in the hands of a culture that has contempt for the truth of God's Word. The way we don't allow this to happen is by constantly renewing our minds to the Word of God. Right thinking about matters always precedes right behavior. A bold lifestyle is not afraid to live tenaciously by God's principles, standards, and instructions, even if it means sticking out like a sore thumb. But to do this we must have a rock-solid conviction and commitment to the Bible. We cannot be casual with it; we must be consumed with it. We must constantly be in it so it can become a natural part of us. And as we do this our target is greater holiness. And when we reflect God's holiness, we bring honor to Him and truly shine for Christ in a dark world. We need a bolder witness. A bold witness is one that cannot help but speak about the good news of Jesus into the lives of others. Peter and John were so captive to the truth of the death and resurrection of Jesus that when threatened with bodily harm, they defied authorities and refused to stop telling others about Jesus (Acts 4). The urgency and ultimacy of the message gave them courage to act and be bold in the face of great opposition. Again, it is fear of others that keeps us from being a bold witness. However, what we must learn is that the ability to be a bold witness is not within ourselves; it results from being filled with the Holy Spirit. Peter, who so courageously stood in Acts 4 was the same guy who about two months earlier denied even knowing Jesus. Same guy! The difference was that in Acts 4 he was filled with the Holy Spirit. Being filled with the Holy Spirit is simply a spiritual condition of a believer. It is when we are fully submitting our wills to God's, trusting in His provision, protection, and presence, while pursuing to obey Him in all things. Then, we are walking by the Spirit rather than quenching the Spirit. Then, and only then, we can have a true boldness from God. The ability to be bold in the right moment is determined by the choices made days, months, even years before that moment comes. Being bold is an overflow of the choice to nurture spiritual discipline and live by the maxim that it is better to trust God than others or myself. If you and I want to make a true impact on our own lives and others, then we must pursue being more bold followers of Jesus. The early church had no resources and lived in a hostile environment. Yet, God worked through their boldness to turn the world upside down with the gospel of Jesus Christ. That same power is available today to impact our communities, if God's people will just be bold. It is the bold congregations that will survive and thrive within this ever growing spiritually apathetic American culture. The spiritually wimpy and worldly will at best limp along without real impact, but mostly likely die slow, agonizing deaths. Let's be bold by His grace and for His glory!